Edgemont residents are actively engaged in their community and keeping them informed is our top-priority. The Inside Edge is the official community newsletter, and covers community news and is published monthly to keep content current and relevant. Delivered to every household, apartment, and business, every resident is acquainted with the community’s most important information. The community association shares space with Edgemont Elementary school, allowing it to have access to the gym in the evenings. The community center also contains a fireplace, hardwood floors popular for yoga and dance, a commercial kitchen and a preschool. Some of the programs facilitated by the community association are the Edgemont soccer association, softball, basketball, grassroots hockey, yoga, seniors power walking, tutoring, and before and after school programs. Scouts, Guides, Toastmasters, Kung Fu, gymnastics, and a teen drop in program also make use of the center. The association, in partnership with neighboring communities, has arranged for the establishment of a local skate park during the month of July. 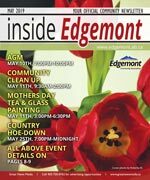 Edgemont offers a number of summer programs as well, including basketball camps, a teen workshop, and a summer program for children in partnership with Calgary Parks and Recreation. This program offers games, sports, crafts, music, creative writing, drama, day camps, babysitter training, and bug science courses. In the City of Calgary’s 2012 municipal census, Edgemont had a population of 15,898 living in 5,421 dwellings, a 1.1% decrease from its 2011 population of 16,082. With a land area of 6.6 km2 (2.5 sq mi), it had a population density of 2,409/km2 (6,240/sq mi) in 2012. Residents in this community had a median household income of $88,442 in 2000, and there were 8.6% low income residents living in the neighborhood. As of 2000, 33.9% of the residents were immigrants. A proportion of 5.8% of the buildings were condominiums or apartments, and 11.1% of the housing was used for renting. . For more detailed info visit the City of Calgary community profiles site.